Health care, by its nature, weaves a complicated web. EHRs capture more bits and bytes of information every day—data that increasingly include medical images. Digital images from PACS can be integrated within EHRs and health information exchanges (HIEs) for online viewing and quick sharing. While many hospitals are beginning to deploy these new and improved medical image exchange technologies, they also must remember to protect the confidentiality, privacy, and security of the images being shared, just as they protect the data contained in EHRs. Herein lies the need for increased awareness and new levels of oversight. Remember how medical records used to be distributed and managed in several departments? Back then, the preferred strategy was to centralize patient records. Now hospitals are experiencing a similar dilemma in dealing with medical images. However, today’s challenge is even more formidable since images generated by departments such as radiology, cardiology, and neurology come from devices purchased from a variety of vendors. These disparate imaging technologies can generate proprietary file formats, each requiring a custom viewer. A wide variety of study types are stored in the PACS in proprietary formats, making it cumbersome to move images in and out of systems. The only viable option, until recently, was to burn a CD and physically hand it to the patient. According to recent studies, 50% of patients undergoing a medical imaging study receive a copy in some format. And nearly all of these patients want to share images with friends, families, and other physicians. However, when patients are responsible for physically managing their images on CDs or other formats, images become susceptible to damage, data access and security concerns grow, and continuing care providers who can’t open CD-based images simply repeat the exam. All of these concerns raise red flags for health information management (HIM) professionals. The release process for medical images is more complicated than ever—and full of risk—as images are created and released across departments and different systems that are not accessible by multiple users. Training and controls on release policies and procedures require information management expertise and must be an integral part of the equation. Since the same privacy and security rules apply to the release of digital medical images as to the release of electronic records, HIM departments can no longer remain segregated from imaging processes, technologies, and safeguards. So how does HIM control, limit liability, and improve the release process of medical images? 1. Create a centralized infrastructure. The first step for improving imaging capabilities is to centralize all medical images, collecting them from all the PACS and mini PACS. This creates a centralized infrastructure that serves as the foundation for the next four steps. One preferred option to achieve this is to use a vendor-neutral archive (VNA) as the central archive across all study types. VNAs combine the medical image formats found in DICOM and non-DICOM data, allowing them to move to a single system that boasts several key enterprise benefits. At its core, a VNA is designed to translate the proprietary formats used by all vendors; it stores divergent types of information in one more convenient system. VNAs consolidate disparate study types and can provide tangible financial cost savings as hospitals create one infrastructure for archiving—an advantage in the event of a disaster because it provides business continuity for clinical user access recovery. Separating the primary medical image found in the PACS from the archive copy allows current workflows to remain seamless for physicians. VNAs also limit the number of places HIM staff must go to manage information as well as the number of interfaces required to connect these many systems. 2. Implement a medical image exchange based on HIM principles. The second step is to install and deploy a medical image exchange. One key to success is positioning this exchange on top of the archive. Many exchanges interface with a few PACS and retain information for a limited time based on the estimated life cycles of how that information is used. Solutions based on the concept of first in, first out can be effective. However, a growing number of available solutions are basing their medical image exchange systems on centralized archives, and the value of access to all studies, both current and historical, is key to supporting the release of information (ROI) process. Hospitals must remain cognizant of the role their image exchange plays in ROI. Access, controls, and reporting functions often are detached and not integrated components, and most of these systems weren’t designed to provide work queues to support release processes. However, it’s intrinsic to a medical image exchange to enhance an organization’s ability to share patient information within the health system as well as outside the network. That makes this solution one that information professionals should become familiar with. HIPAA privacy and security, patient consent, and opt-in/opt-out procedures for medical image sharing all depend on expertise to reengineer traditional imaging release workflows. 3. Add a single viewer. The third step along the path to enhanced medical image sharing is to add a single viewer to the infrastructure being created. This is the exciting part of this process: the ability to view medical images from any desktop or any device, stationary, or mobile, and for any party along the continuum of care, including attending physicians, specialists, surgeons, patients, and primary care physicians. One problem here is that some common viewers aren’t considered to be diagnostic quality. Additionally, other viewers, while deemed as being diagnostic quality, aren’t unless paired with devices that have diagnostic-quality monitors. These viewers are excellent for enterprise sharing and viewing, but users must utilize the appropriate equipment required for competent diagnosis if that’s the intention. Some solutions are better at this than others. Despite this obvious drawback, access to medical images—even with quality concerns—still is an exciting proposition for providers. 4. Balance security with image access. When observing medical images through a single, remote viewer—an integral part of the optimal infrastructure described—users leave no trace of having visited the data. This is because the viewer features a zero-footprint download, an important security feature. No software is loaded onto the device, and no patient data are downloaded to local drives. And there’s no audit trail for HIPAA compliance or information accounting of disclosure reporting. When the user is done viewing the image, all traces of the user, the image viewed, and accompanying patient data are gone. The images don’t move to the device; they’re simply displayed. HIM professionals, in their efforts to comply with HIPAA, limit liability and improve image exchange, covet the capability of recording accounting of disclosure, and reach deeply into imaging systems to determine who viewed images at what time for what purpose and what they did next. However, the zero-footprint scenario described above is likely the future of medical image exchange. 1. How do you get confirmation from the viewer that someone actually opened the image and observed it? 2. Can you track user views in an accounting of disclosure report? 3. If I’m using an image exchange with e-mail addresses as the ultimate destination, how do I match an e-mail address with a user name and credentials for the purpose of monitoring? A complete solution should incorporate the ability to track all access to medical images while maintaining a rapid-access experience for the user. 5. Integrate medical images into the EHR. The next step is to promote medical images into full-fledged members of the EHR. What started as simply providing patients a copy of their films has evolved into a complex process for integrating medical images from several study types into the EHR, providing access for physicians and caregivers. 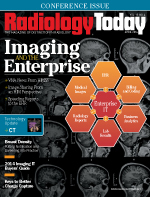 As an added benefit, image-enabled EHRs let radiologists and physicians collaborate while viewing medical image studies from separate locations. Patient care improves because of better access to the studies, which now are conveniently housed within the EHR. Communication improves within referral patterns, and physician and patient satisfaction scores all increase in the presence of these strategies. The new workflows require that features of the image exchange be extended to the EHR screens. Consider this clinical scenario: At this critical juncture, as the physician is preparing the results of a visit, wouldn’t it be great if he or she could direct the system to send an e-mail link of this image to another physician or the patient to facilitate a referral? This scenario goes beyond image enabling the EHR with medical images; it opens the door to improve revenue strategies by providing exchange functionality at the correct point within the physician workflow. 6. Apply Web services. The final step in this journey involves adding all types of Web services. In this day and age, many of us are constantly working. When we’re not working, we’re still connected, with the ability to react to critical issues. Having several types of Web connectivity supports users during the short windows of time they have available to respond. The technology exists and a hospital’s ability to connect image exchanges through several methods should be cultivated. Physician portals, patient portals, HIEs, and URL or smart links to key Web pages and hospital websites all are part of an optimal solution. However, HIM professionals must be actively involved in each step of the process to ensure that adopted strategies are appropriate for image release and security controls. Important decisions among HIM, radiology, and IT should be made together to best implement medical image sharing technology within their organization. Here is a difficult objection you may face: “If we’re already doing some of this with our existing PACS, why should we spend money on doing an image consolidation project?” The answer is different for everyone. Take the time to carefully produce a return on investment impact report, and you’ll be astounded at how strong your argument will be. The road to implementation may seem long and circuitous. However, working together with radiology, IT, and health information professionals, the results can be visionary. — George Robbie is general manager of the medical image exchange division for GNAX Health. 1. Build an infrastructure that utilizes a vendor-neutral archive (VNA). 2. Add the medical image exchange on top of the VNA. 3. Add a univiewer, a single, nonproprietary software for viewing a variety of study types. 4. Add integration to the EHR to provide enterprise access. 5. Add Web services, enabling physician and patient portals and health information exchanges.